We keep getting glimpses of the new Oh Sees album – Putrifiers II out September 11th from In The Red Records – and we’re starting to realize that we’re more excited for this release than we have been for any new Oh Sees material in a long time. The first track we heard – “Lupine Dominus” – was total driving kraut jam and now we’re hearing the new track – “Flood’s New Light” – that has John Dwyer and co. cleaning up a bit for a more succinct pop song. You can preview it right down there. The guys over at P4k debuted it this morning and awarded it their “Best New Track” tag – we can’t say we disagree when looking at most of the other stuff they’re slinging. 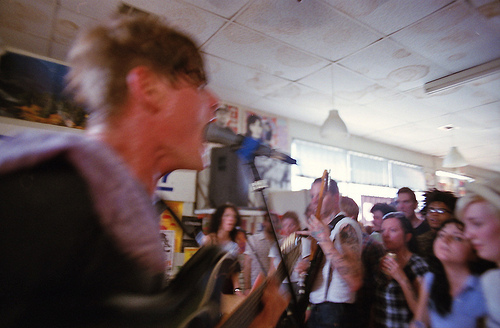 They also have a nice video of Thee Oh Sees slaying in Chicago earlier this Summer. Check that out below. Thee Oh Sees will be in town September 20th co-headlining our birthday bash at The Zombie Shop with Ty Segall, Ex Cult, Useless Eaters, Gnarwhal, and D. Watusi. See you there!